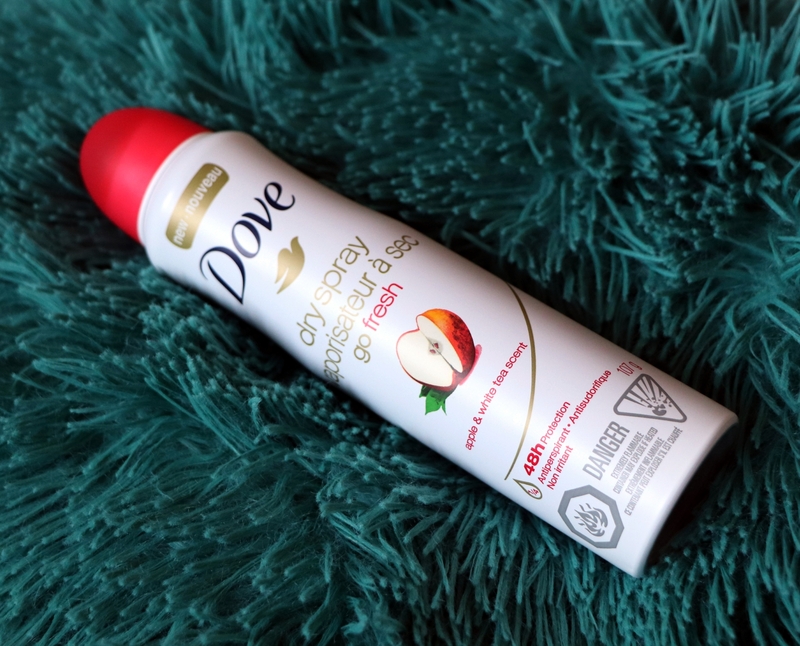 The New Dove Go Fresh Apple and White Tea Dry Spray is the perfect match if you are looking for an antiperspirant deodorant with 48h protection and an addictively fresh, fruity fragrance. 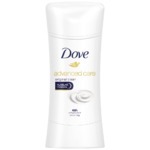 The mild, alcohol-free formula helps reduce irritation caused by shaving and dryness while Dove’s unique ¼ moisturizing cream cares for your underarm skin and helps to recover from any irritation that regular shaving might cause. 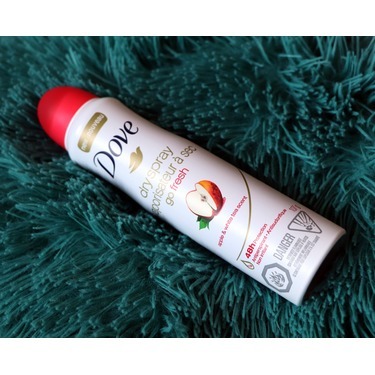 Le nouveau vaporisateur à sec Dove Go Fresh Pomme et thé blanc est la solution parfaite si vous recherchez un antisudorifique offrant 48 h de protection et un parfum irrésistiblement frais et fruité. 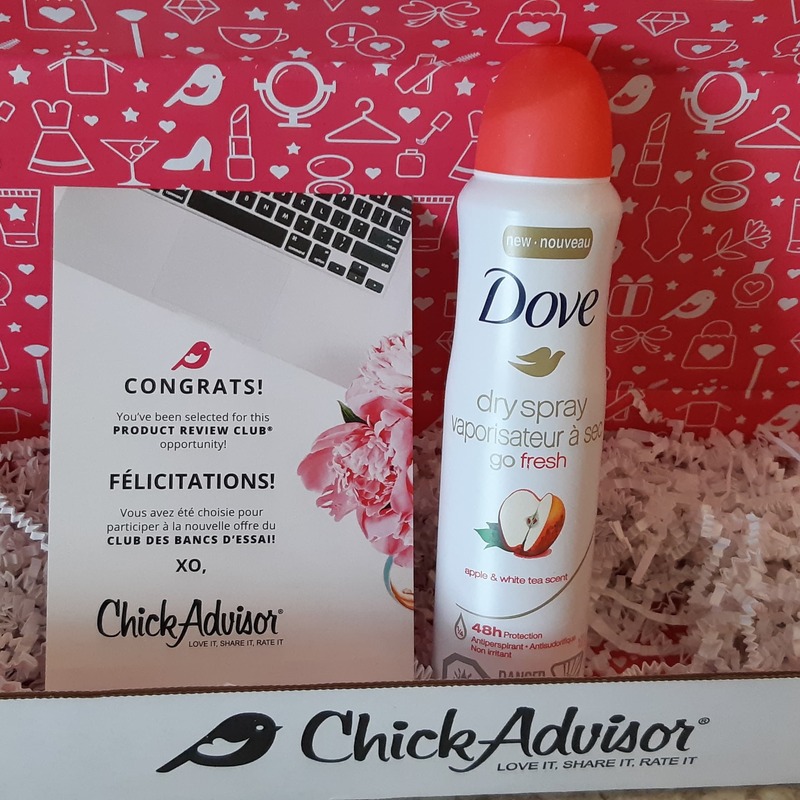 Sa formule douce sans alcool aide à réduire l’irritation causée par le rasage et la sécheresse, tandis que le ¼ de crème hydratante unique de Dove prend soin de la peau des aisselles et vous aide à récupérer de l’irritation que pourrait causer le rasage. I received this product from Chickadvisor and started using it right away. I like the easy spray nozell and even application. I carry the bottle in my purse and use it in the middle of the day. 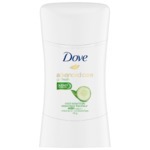 I love the light scent and how this keeps me smelling fresh and clean for many hours. I will buy this again! 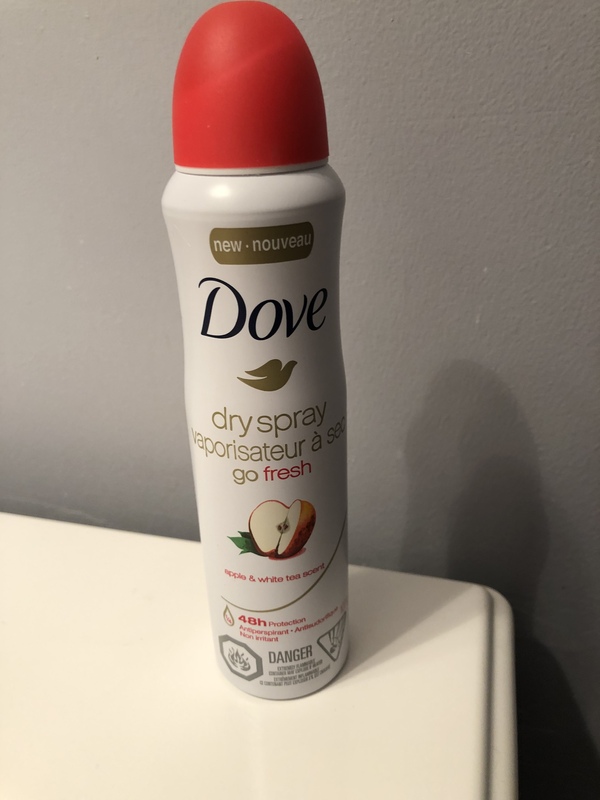 After many years of not having to use an antiperspirant I was in need of something that would last and not have an overly strong scent. 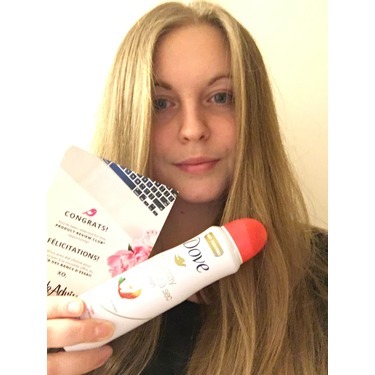 I bought this Dove product and have been very impressed with it. 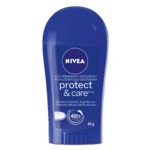 I put this antiperspirant on at 4am before going to work and I never need to reapply, works great!!! 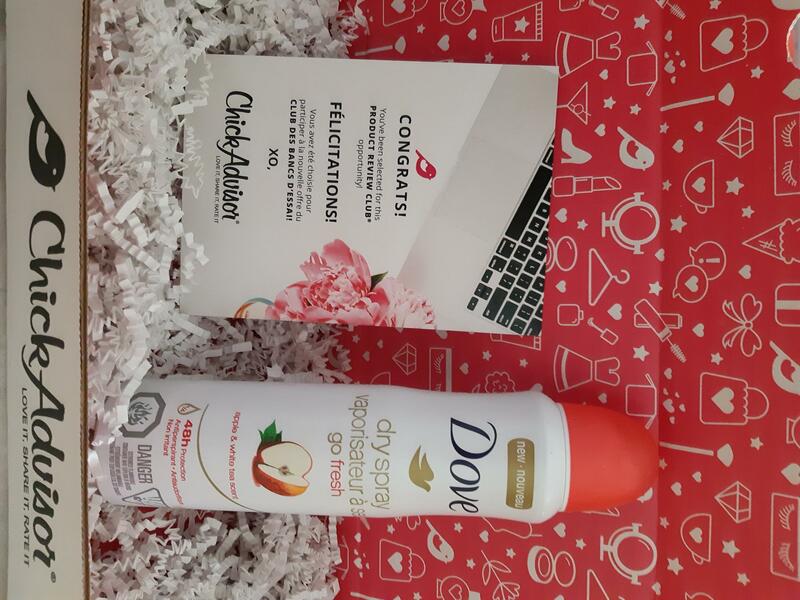 This smells like christmas to me! 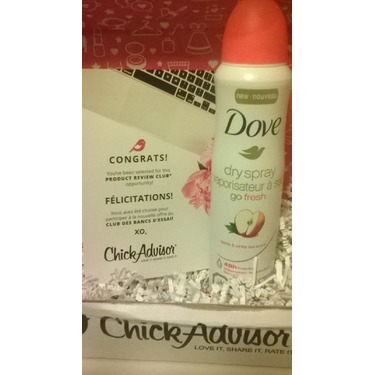 It was sent to me from chickadvisor in exchange for an honest review. The smell is sooo nice but after a few hours it just smells like really bad BO on my body... Huge pass... I would buy this as an air freshener hahaha. 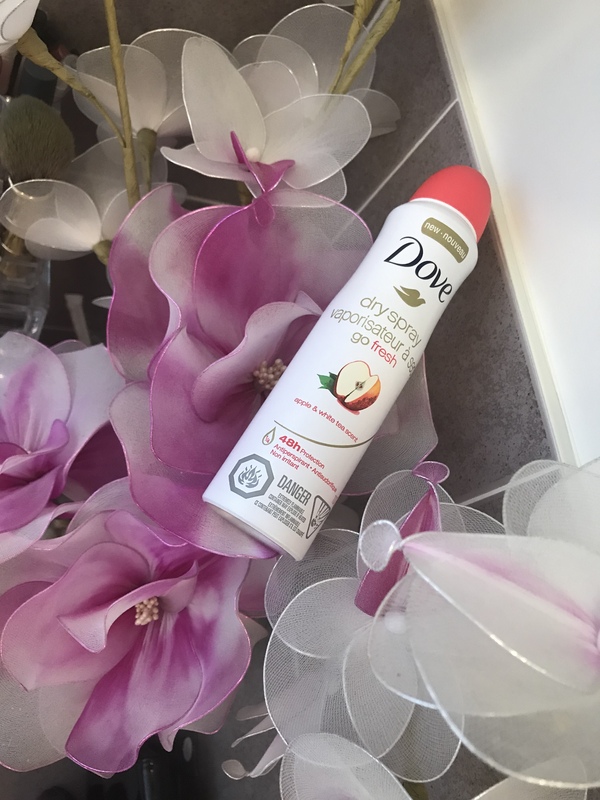 This dry spray smells nice. It’s subtle and feminine. It worked all day protecting my armpits. I am not very active during the day, but it did not cause any irritation. I would recommend it. The bottle is nice and slim, its undestandable what is it and the smell that it has. Its understandable what is needed to be done and how to spray. When you spray it it semlls nice, keeps fresh for a few hours as well as dry, the only thing is that white residue transfers onto clothing. Amazing for Those That Workout!! 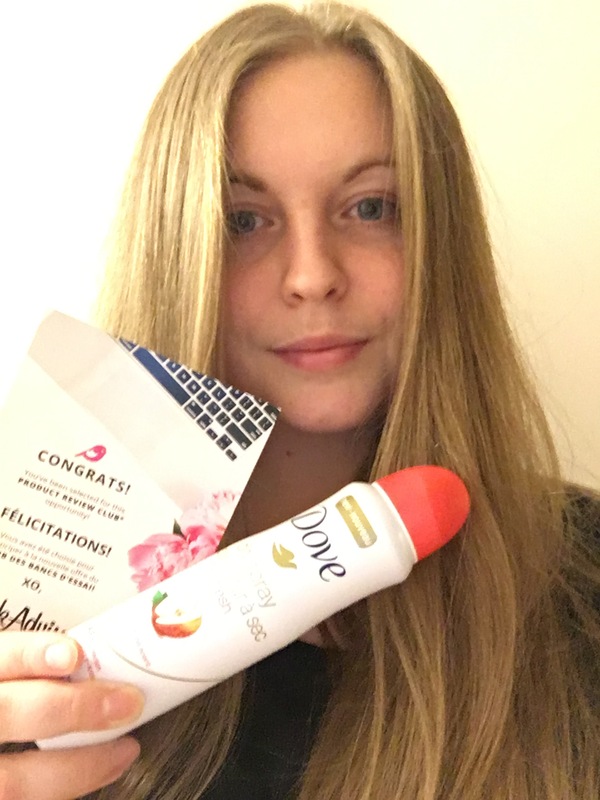 I'm an avid runner and I was excited to try this new antiperspirant! It works great! It kept me smelling great even after my workout was complete. The scent was a bit too light for my liking but it's not too bad. It's effectiveness outweighed the scent. It does go on dry too. So getting dressed in a hurry is not a problem! I would definitely buy this product! 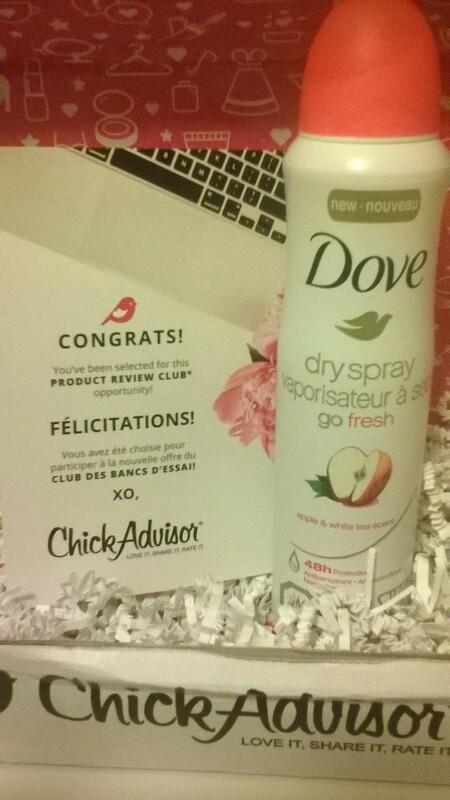 I received this product complimentary in exchange for my honest review. 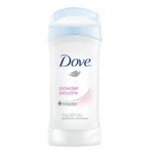 I wear antiperspirant every single night before I go to bed (right after my evening shower to keep that fresh feeling). 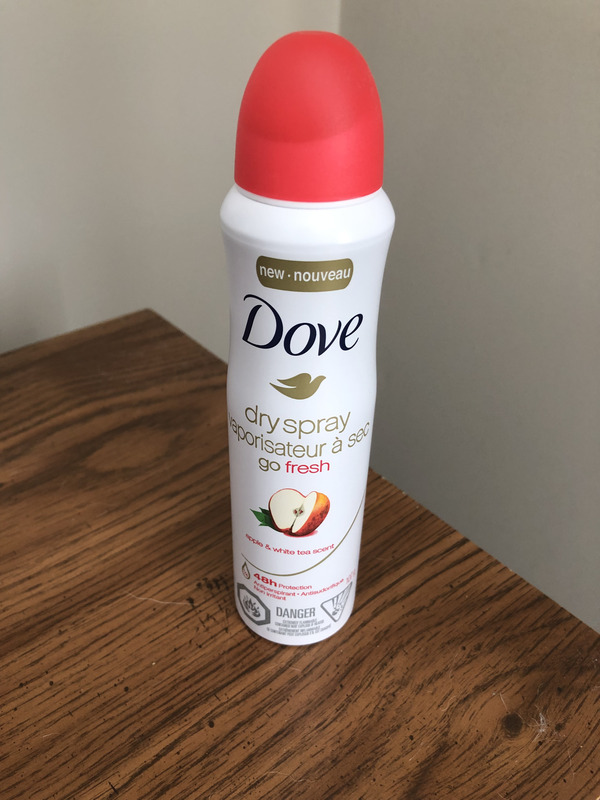 I typically use products that don't have scents because most I have encountered tend to be incredibly overpowering but this was a light, fresh scent that was subtle. 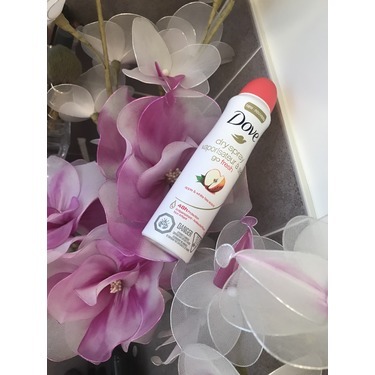 The antiperspirant was also long-lasting as I felt fresh when waking up and could even still get hints of the scent! 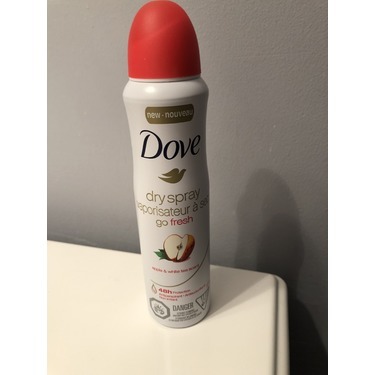 I loved the smell of this deodorant but feel like it didn't keep me fresh all day. I had to reapply during the afternoon. I thought that it wasn't lasting as long as i has hoped. Other than that i liked that it didn't smell to strong and that the smell was also nice.